Integrity/Authentication –The very nature of encryption requires the file to be decrypted first before it can be modified, this ensures its Integrity. The authentication is once again covered by the Access Control using Encryption/Decryption. Security/Integrity Controls –Once again, the encryption satisfies these requirements. AxCrypt-Encryption-Guide.pdf (Optional) --This guide is available in PDF format for those users who feel the need to print this document. 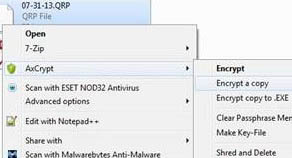 STEP #1) Go into where ever the file is located that you need to encrypt and click on the file. 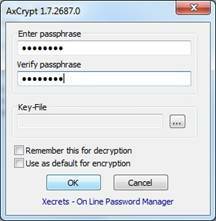 Now, Right click on the file you need to send to us and click on “AxCrypt” and then on “Encrypt a Copy” (as shown in the image to the left). STEP #2) Enter your assigned passphrase that we will use to open the file. Note: Some offices may choose to use the “Use as default for encryption” option (located above the “Ok” button). This will automatically use this same passphrase for all file encryption in the future, alleviating the need for staff to manually enter it each time. Keep in mind that if your office uses this feature that the passphrase could be copied by staff, which could be a problem if they leave the office. STEP #3) You will now have a file that looks something like this. You now need attach this file to an e-mail and send it to us.